Its been a busy time here at Up sticks and we have been very fortunate to have had such a lovely set of guests join us for our first season. We’ve shared some guest reviews and feedback for your to see below. There was trepidation when deciding to open our doors to strangers, but the season has proved to us that people are generally fun and pleasant to have around. We’ve enjoyed sharing this special space with everyone who has stayed. There have been a few entertaining questions whilst the kids have genuinely cracked us up at times, and it’s all worthwhile when we get the kind of feedback we’ve had. We always knew that people glamp to escape the everyday and to explore something different. As part of that story we wanted to make our place special and unique, but more importantly it was how we wanted everyone to feel here that really mattered. Free time is so precious, probably even more so than the money, so when booking to spend your hard earned holiday with us, we wanted to ensure guests went home with great memories and a warm glow. The fact that so many of our lovely ‘tibes’ want to return is a bonus, we’d love to see them all again, learn their life news, meet new additions watch growing cherubs and pampered pooches. What is clear is that when people have a relationship with a place they become attached to it – which means us as well, they feel connected. The balance of being around enough with the right information and not smothering is crucial, as is having enough to do balanced with the space and peace to sit and contemplate. We were surprised by the number of guests who just wanted to be still, not walk the hills or cycle the lanes but just stop – testament to the space being somewhere people feel at home in. Our concerns that there would be enough for everyone have not been born out, it seems people want their own slice of countryside. Not that that means we haven’t got plans. Steve is planning zip wire, I’m planning a chill out space with hammocks and a communal pop up bar as well as more goodies in the pantry. Having said that we are mindful that our guests don’t want a theme park, so everything we plan to do will still have our own brand of special, and we’ll still be on hand to give it that personal touch. 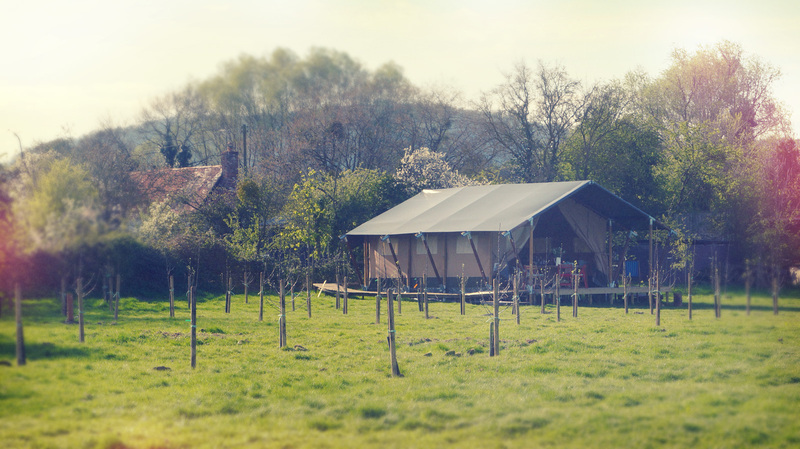 We have just returned from 2 nights at Up Sticks Glamping and I cannot recommend it highly enough. The tent is gorgeous and furnished beautifully, it’s all very rustic but extremely cosy… Although the accommodation itself is fantastic, it’s the hosts Charlotte and Steve who really make the experience. Both were extremely friendly and welcoming and on hand with suggestions of things to do in the area. We arrived to a kitchen stocked with essentials but also cakes, jams, bread and a bottle of wine and there is a pantry onsite where you can buy more of whatever you need. We made use of the firepit to the left of the cabin to barbecue on our first night, and the food in the pub which is a 2 minute walk away was great and very affordable on Saturday night. This was a real trip to the country complete with sheep, goats and chickens who are more than happy to be fed and stroked as well as a very friendly cat and dog. We absolutely loved the weekend and would recommend it to anyone looking for a weekend away in the country. Thank you both so much for having us! Upsticks was luxuriously appointed safari tents, with lots of unique touches. We arrived and were sitting on the deck with wine and nibbles in half an hour…effortless camping! It is a peaceful and bucolic setting, but also close to lovely villages and walks. The tent was spacious and comfortable. All the furnishings made it feel indulgent. Our hosts were friendly and helpful. We didn’t want to leave! We absolutely loved our stay here – Charlotte and Steve made us feel so welcome from the moment we arrived. There were unexpected local treats too already chilling in the fridge (wine, strawberries, cream, milk etc) and they had also left out fresh homemade cakes and brownies and local artisan bread we kept finding all the little touches throughout the weekend too like the marshmallows and skewers for toasting on the campfire. The accommodation itself is absolutely gorgeous and so well thought out. You can tell that each thrifty vintage item has been lovingly picked out. The beds and bedding are all brand new and so comfortable! There was loads of space around the tent – way less cramped than loads of other glamping places we looked at. We spent every night around the campfire looking up at the stars & had total privacy. We already can’t wait to visit again! I am not now, nor ever will be, a happy camper. The thought of spending nights under canvas in a field fills me with dread. Suffice to say that when my wife booked a glamping holiday for us and our four children, I was less than impressed with the idea. That is of course, until we arrived… Though we may of been the first guests to stay, I’m certain we won’t be the last. The “tent” if you can call it that harks of something out of Africa. Big comfortable beds and quality duvets ensure a good night’s sleep. Leather sofa, log burner and a hob adds some home comforts to the camping experience and the dab radio is a nice bonus. Our older children absolutely loved sleeping on the mezzanine together and at no point did we feel cramped (even though there were six of us) The welcome basket with a selection of treats on arrival is a nice touch. The meats and bread available from the hosts are sublime, even catering for gluten intolerance. I must mention the brioche buns are a must for those of us more able to eat bread. Top it with the hosts delicious chocolate spread and you’re on to a winner. So, has my experience warmed me to the idea of camping? I don’t think so. No. Would I go back to upticks? Absolutely! In fact we’ve already booked our return and I can honestly say that we will back further into the future to see how it grows. My advice to anyone reading this review. Book a break here and you won’t be disappointed. We spent 2 nights at Upsticks and had a fantastic time. It was our first glamping experience, and I think this site will be tough to beat. The safari style tents are clean, comfortable and well-equipped. There are 2 bedrooms, plus a mezzanine floor above with extra beds. We had pre-ordered a BBQ pack which saved us the bother of bringing too much food, and it was really good quality meat. There were also nice touches included, like homemade cupcakes, marshmallows, meringues, cordial, and of course, a bottle of wine. There’s a board walk that leads from the tent to your own private bathroom, which has been nicely done out. There’s even a hair dryer provided! I didn’t expect that! Charlotte and Steve were great hosts – giving the kids a tractor ride, providing food to feed the sheep and goats, and they went above and beyond in allowing my husband to watch the Lions match with them. Plenty to do in the area too. We visited the beautiful Medieval town of Ledbury, and Eastnor Castle – both of which I’d recommend. Why not read them for yourself on Trip Advisor, Facebook, and Google.